Two men have died in an accident involving slurry on a farm. 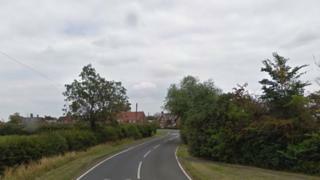 The 35-year-old and 19-year-old died on Thursday on the farm near Bottesford, north-east Leicestershire. The Health and Safety Executive said it was believed to involve a delivery of slurry to the site but it is not known "how the men were exposed". It is being reported by the Leicester Mercury the men were trapped in a tank and the fire service tried to cut them free. A spokeswoman for Leicestershire Police said: "Officers are carrying out inquiries on behalf of the coroner after two people died at a farm in Normanton Lane, Normanton, near Bottesford. "Officers were called at 16:30 on Thursday. Post-mortem examinations will be carried out on the two men, aged 35 and 19, to determine the cause of death."